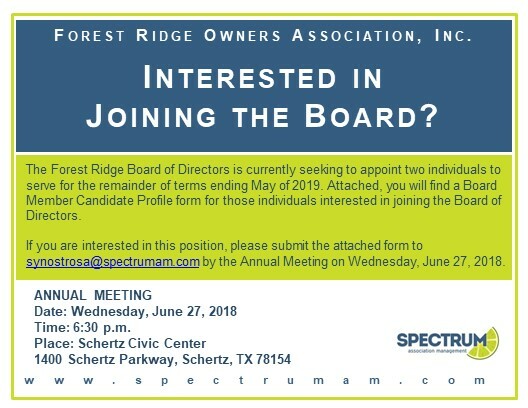 Forest Ridge Owners Association, Inc. is a non-profit organization that owns and maintains the common property and facilities in the Forest Ridge Subdivision in Schertz, Texas. This community seeks to provide a quality environment for all residents and a safe and friendly place for families to live. The association consists of committees and a Board of Directors, who are homeowners elected by the voting members. Forest Ridge is a gated community with 316 lots. The community includes a swimming pool, playground, walking trails and professional landscaping throughout.